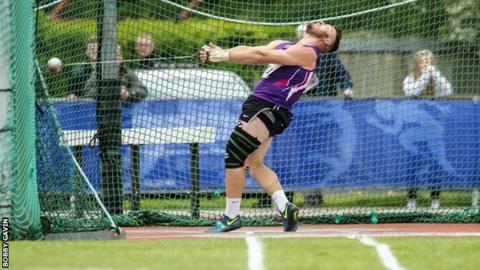 Commonwealth bronze medallist Mark Dry broke a long-standing Scottish hammer throw record at the Loughborough international. Dry, 27, threw a World Championships qualifying standard of 76.93m, eclipsing Chris Black's 75.40m in 1983. "I spoke to Chris Black just after the throw and gave him a hug at the side of the track," said a delighted Dry. "I apologised for taking his record but the truth is he was wanting to see it beaten." Dry, who took bronze at Glasgow 2014, was competing for the hosts Loughborough University, his home track. "It [the record] has stood for a long number of years - too long," he said. "I was getting close back in 2012 when I was throwing 74m more consistently. "But, it has been a long road to this point and this could open doors for me now - get me into better competitions, that kind of thing. "It is a World Champs standard, which is 76m, but I may well need to go out and do it again now. I was nervous last night knowing that Loughborough is my home patch and the best chance to get that kind of distance. "It is just about getting things right on the day and I have always believed I could reach this kind of distance." Meanwhile, Jax Thoirs broke his own Scottish pole vault record, with the US-based university student clearing 5.65m in Los Angeles and fellow Scot Rhona Auckland won British Championships 10,000m gold at Highgate on Saturday.